WANGARI MAATHAI –RIP: This is the last image I ever captured of Wangari Maathai at the Serena Hotel, Kampala on 6/4/2010 before she passed on at the Nairobi Hospital with Cancer on September 25, 2011. I remember her speaking with such authority alongside two other women laureates. It was a press conference organized by the Nobel Women Initiative to magnify the power and visibility of women working in countries around the world for peace, justice and equality. Here are a few facts to note about Wangari. – Awarded the Nobel Peace Prize in 2004 for her actions to promote sustainable development, democracy and peace. -She is the first African woman to receive the Nobel Peace Prize. -Founded Green Belt Movement that has assisted women in planting more than 40 million trees on community lands including farms, schools and church compounds. -I n December 2002, Prof. Maathai was elected to Kenya’s parliament with an overwhelming 98 percent of the vote. 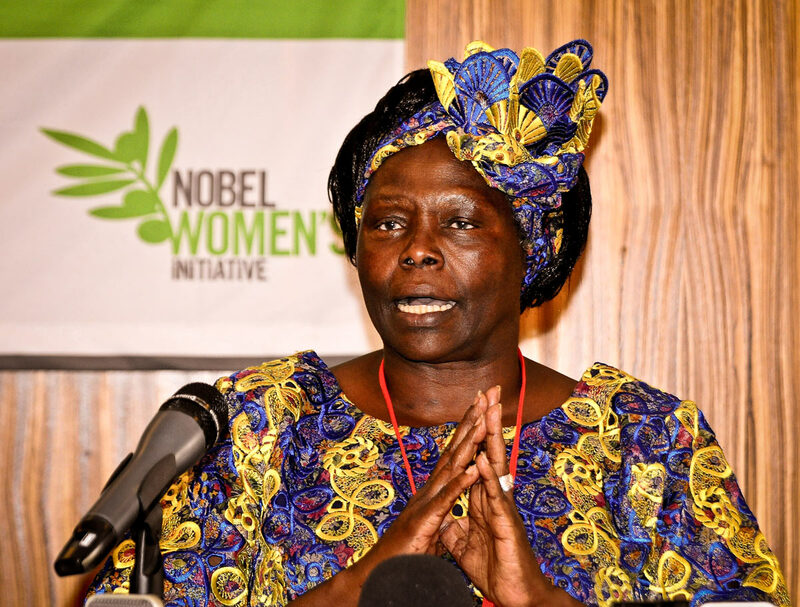 – From 2003 to 2007 Prof. Maathai served as Assistant Minister for Environment and Natural Resources in Kenya’s ninth parliament. -In September 1998, Prof. Maathai launched and become co-chair of the Jubilee 2000 Africa Campaign, which advocates for canceling the debts of poor African countries. – She is the author of three books; an autobiography, Unbowed, and an explanation of her organizational method, The Green Belt Movement: Sharing the Approach and the Experience. Her newest book, The Challenge for Africa was released in April 2009. Thank you, Edward. Let’s all do our best to make sure, Wangari Maathai didn’t live in vain..
May she rest in peace…..
Great photo. Incredible woman, what a life! May she rest in peace. What an amazing woman. An African woman, amoung many to be very proud of. I hope that her and Miriam Makeba are enjoying a cup of tea together in Heaven!